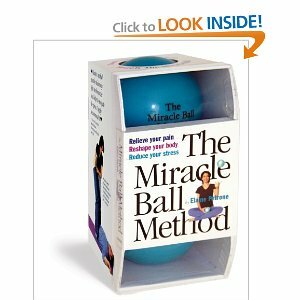 My mother gave me the Miracle Ball Method for Christmas last year. I have to say, they do work to release tension in specific muscle areas also known as Trigger Points. Chiropractors have told me to use tennis balls for self massage and you can use Miracle Balls the same way. Basically, you lay on the floor, place a Miracle Ball under your back in the area that is tight and then rock back and forth on the ball until it “massages” your muscles. Tennis balls are harder and if you need a firmer “touch” you may want to use the tennis balls. But I found the larger size and “squishiness” of the Miracle Balls made them more comfortable to use and I could lay on them longer. Andrew, one of my massage therapists at the Working Well Massage chair stations, uses golf balls to massage his back, but he is a lot tougher than I am! The key to using tennis balls, or Miracle Balls, is to place them on areas of your muscles only–not on bone and definitely not directly on your spine. If you are under a doctor’s care for muscle or spinal problems, consult your doctor before using tennis or miracle balls or any other exercise! Seniors and those with excess body weight may have a hard time using these balls according to Amazon reviewers. And of course, there is no substitute for human touch and a real massage. But in a pinch, I find the Miracle Balls a nice quick self massage tool. • When I first saw this set of 2 small, blue-green balls, I really wondered whether they were any good. Decided to take a chance, and I am sure glad I did. Propped myself over these 2 semi-inflated balls on the floor and it was sheer bliss as my own body weight sank upon them. The set consists of 2 approximately 4 inch (11 cm) diameter therapy balls (re-inflatable) and a pocket-sized 296 page insruction book packed in a transparent casing. The balls are approx. a half-inch (1 cm) thick each, and are not as thin-skinned as might be imagined. The book says that the balls are built tough, and are good for up to 300 pounds, and I believe the claim is sustainable. In my opinion, these 2 little balls are fantastic value for money for what they are capable of, and you would be surprised how nice it feels once you prop your tired body over them at the end of a long day. Although these are therapy balls, you may also want to use them as I frequently do – a simple and ‘fun’ way of giving your body a much needed self-massage, merely by placing them at strategic locations beneath your body and resting over them. By the way, I am not one of Ms. Elaine Petrone’s student, since I am writing from half a world away. But, I am definitely her fan now after being convinced by these 2 little ‘Miracle’ balls! Go http://www.elainepetrone.com for more info. My advice: considering their low price, get them while they are available, as these little balls are ‘hot’ – they were all sold out on Amazon.com until recently. • I am a licensed Massage therapist in Hawaii. I stumbled upon Elaine’s book and started using it for my neck & back pain. I was pleasantly surprised at how deep my muscles and spine could be worked while I did two simple things Breath and Relax. Although breathing and relaxing is simple it becomes more difficult the longer the balls are in one position and works deeper into the muscles. At that point I choose either to move positions or focus on relaxing further and deeper breathing to let the ball(s) work deeper. I’ve recommended the product to clients to use in-between massage treatment however discipline to use the balls is a stumbling block for many. I have found if a client uses the balls prior to a massage treatment, generally don’t have to work the muscles as deeply because they have already begun to relax. Deep tissue client get much better result than just a massage alone. I’m buying more to give away and sell in my practice because when used correctly on it’s own can be a healing resouce for many patients who are disiplined to use this self treatment. • Just a suggestion on this product: start out easing into it. Too much too fast will put you in pain, but with starting gently for a very short time you can find relief. It really has been helpful with sciatic pain using one or two balls in the lower back/sacariliac area. I’ve wanted something like these balls for a long time as I sensed that putting pressure on a spot by lying on a ball could help. They do work. Worth the price. • If you have serious pain or injury, like sciatica, consult your doctor and see a chiropractor. However, if you have nagging back pain that you know is brought on by tight joints and muscles, stress, or exercise, I would definitely give the Miracle Balls a try. Order Miracle Balls from Amazon for about $12.00 here. Yeah! I love the miricle balls and thanks for the additional info Sue! Glad you like ’em and use ’em! I love them for low back work and my upper shoulders too. Easier on my body than tennis balls and they are wide enough to cover a large area without causing me pain. Thanks for reading and commenting, Kimosha!